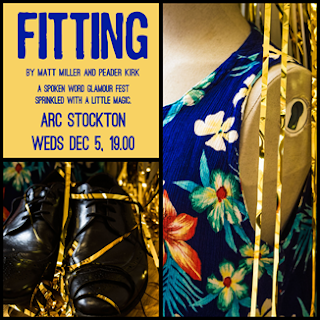 Following their first successful collaboration, 'Sticking', in 2016, Matt Miller and Peader Kirk return to ARC Stockton with their new show 'Fitting'. 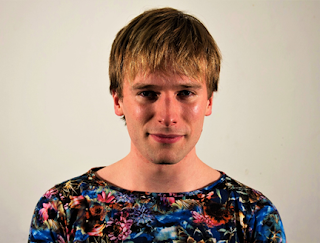 Fitting is a spoken word theatre glamour fest, sprinkled with a little magic, exploding the space between gender binaries and asking where each of us feel we fit. Magic is everywhere. Put on a dress and people treat you one way. Try a pinstripe suit and, abracadabra, its like you are a difference person. They say beauty is just skin deep but why is appearance so important to the way we are treated? To the way we are seen and judged? Matt likes wearing suits and Matt likes wearing dresses. Matt likes being visible and Matt likes being invisible. Matt likes making things appear and disappear. Matt is a poet and a performer. Matt is flirting with how appearances shape the ways we treat each other. Matt will appear onstage tonight. Matt has frocks and ties, some slight of hand and some party poppers, he’s fitting in and standing proud. Matt is neither a boy nor a girl but has been both. Matt will do his best, for you. Matt will be performing. Perhaps you are too? Playing a version of yourself tonight. And the version you choose is you, for now. After all, magic is everywhere if you look for it. Fitting explores our shared experiences of visibility, invisibility and finding places to fit in. Fitting is a spoken word glamour fest sprinkled with a little magic dust.